Indiana State University student Nick Jones knows the difficulty of describing his senior capstone class to people unfamiliar with it. He is a part of Sycamore Business Advisors (SyBA), the collection of experiential learning laboratory classes that many seniors majoring in business programs choose to take. But he'd be quick to point out that he's not in the class that is also known as Sycamore Business Advisors, which provides consulting services to local nonprofits and businesses. Rather, Jones is working to resolve the confusion created by the two programs going by the same name (the umbrella organization of senior capstone courses and the business consulting class that is part of it). Yet he still takes a moment to explain the newest aspect of the senior capstone experience he is working with: Sycamore Student Ventures. Students in the senior capstone Business 401 courses have reorganized their umbrella organization from SyBA into Sycamore Student Ventures. 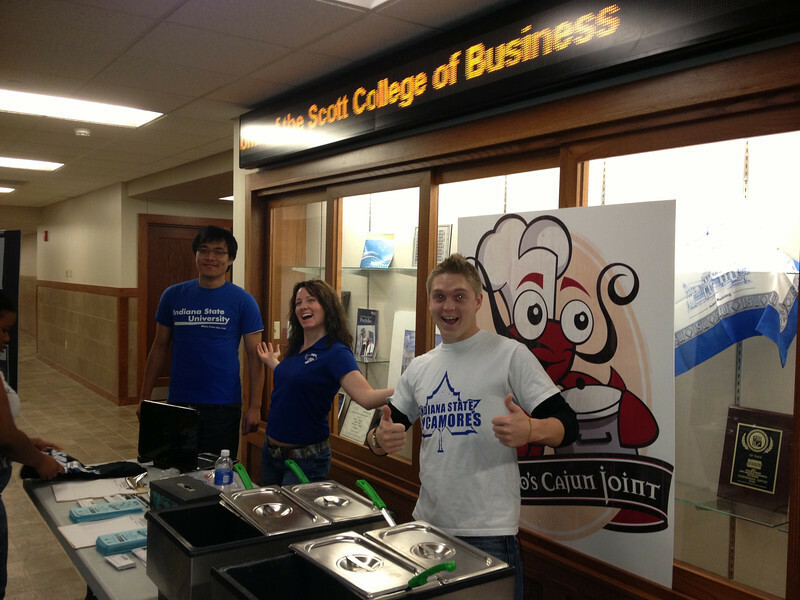 In addition to the consulting business, the organization runs the Executive Express Café. It also includes the group added last spring: Sycamore Blitz Promotions, a marketing agency that partners with the Indiana Statesman, ISU's student newspaper, along with local companies on advertising and social media initiatives. "It's kind of confusing, so I think it's easier to explain to everybody exactly what our company is in saying we're Sycamore Student Ventures," Jones said of the reorganization, "and under this, we have our consulting firm, our café and marketing firm." The business capstone offerings started with the consulting class first known as SyBA. About six years later, SyBA creator Art Sherwood and co-director David Robinson created the Executive Express Café. Eighteen months ago, they used some of the same concepts to begin developing the Sycamore Blitz Promotions marketing firm, said Sherwood, ISU associate professor of management. 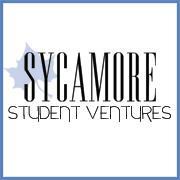 All three organizations that are part of Sycamore Student Ventures are completely student-run and operated. "Really what we wanted to do was find another way to build an umbrella organization over these three businesses that we now run," Sherwood said, "and that's where Sycamore Student Ventures comes from, and the mission is really the educational" component of the organizations that serve as learning labs. Several student groups have been working to get the word out about the change to Sycamore Student Ventures. They created the organization's social media presence, including a Facebook page to highlight the organization, QR codes and additional elements. They also have talked to different business classes in the Scott College to inform students of the different options available for them to major in a Scott College of Business program. "I think that people get it more now that the organization is structured better," Jones said. "But as far as getting people to understand that SyBA has changed to Sycamore Student Ventures, it is a challenge in itself." The different capstone courses provide unique challenges that require students to apply the theory and lessons they have learned about strategic management in their full set of business classes to real-world opportunities. In the SyBA course, seniors provide business consulting services to companies, while students working with Executive Express Café work on the daily operations of the business, from supply chain management to resolving unexpected issues. Earlier this semester, the students replaced the café's credit card machine so that transactions could be approved in less than five seconds. In the newest addition, Sycamore Blitz Promotions, students work as a marketing firm to provide outreach for client companies, several of which are also advertisers for the Indiana Statesman. "This is something that we've been constructing for a while and trying to figure it out," Sherwood said of the course options offered to students, "and the driver behind this is excellent experiential learning." The Sycamore Student Ventures classes are offered each semester, with different companies participating with Sycamore Blitz Promotions and SyBA each time. 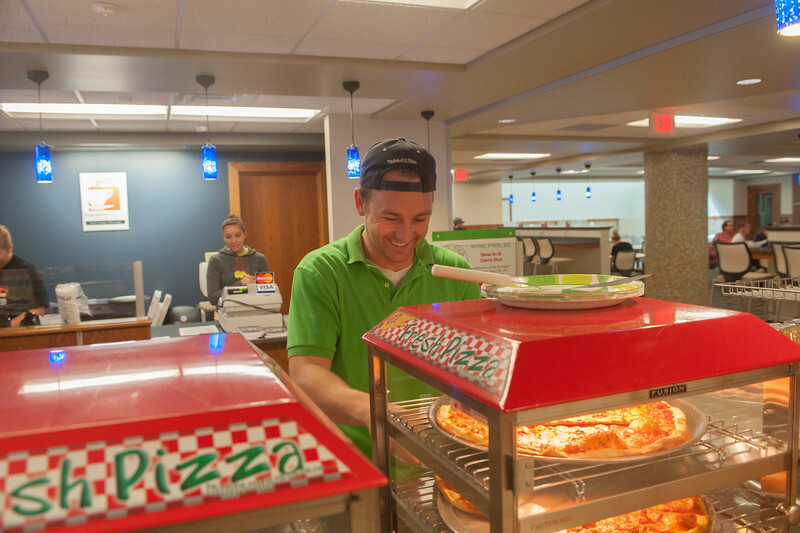 Even students working with Executive Express Café encounter challenges that vary from one semester to the next. "The experiential learning opportunities that are offered in the Sycamore Student Ventures courses help to set apart the student experience at Indiana State University, and particularly the Scott College of Business, from the rest," said Brien Smith, dean of the Scott College. "Business students sharpen their skill set and gain knowledge through real-world experiences that can be directly transferred to their future employers." The opportunities are also benefiting the students working with the restructuring, such as Jones. In addition to working with the new Sycamore Student Ventures initiative, the marketing major also is working on a team that is part of Sycamore Blitz Promotions. "There's really a good mix" of options, said Jones, a senior from Lafayette. "You can really choose what you want to do and really hone in on the skills that you've developed through your years in the Scott College of Business." Photo: http://isuphoto.smugmug.com/Other/marketing/Federal-Hall-Scott-College-of/i-8WVzKSv/0/L/09_13_12_Federal_Hall-3371-L.jpg (ISU/Tony Campbell)An Indiana State University student gets a piece of pizza from Executive Express Café in Federal Hall. The café is completely run and operated by students in the Sycamore Student Ventures senior capstone experience. This semester, students have reorganized Sycamore Student Ventures, which was previously known as Sycamore Business Advisors. Photo: http://isuphoto.smugmug.com/Other/Media-Services/SyBA-for-Austin/i-CD8R6H9/0/L/Gumbos%20Promo%20event-L.jpg (Submitted photo)Several Indiana State University students, including Nick Jones, far right, pose during a Sycamore Blitz Promotions event for J. Gumbo's. Sycamore Blitz Promotions is one of the three organizations that is a part of Sycamore Student Ventures, formerly known as Sycamore Business Advisors. The name of the senior capstone experiences known as Sycamore Business Advisors has been changed to Sycamore Student Ventures. This reflects the students' efforts, which includes the recently added Sycamore Blitz Promotions.